This painting of Christ by Leonardo da Vinci, once owned by King Charles I of England, sold in 1958 for £45. Naturally, when it was re-discovered and exhibited as a real Leonardo in 2011, it caused a minor sensation. Yet, had it been seen for what it is, it might have caused even more fuss.1 Leonardo did not believe in religion as dictated by the Church but thought for himself, clearly aware that the lessons of the Bible had been twisted out of recognition. He wrote to himself: "Many who hold the faith of the son only build temples in the name of the mother." This means, I presume, that those who follow the Church are more intent on worshiping the Virgin than in following Christ's teachings. No wonder he and his pictures were sometimes considered sacrilegious.2 Vasari wrote in his first edition of The Lives (1560): "Leonardo formed in his mind a conception so heretical as not to approach any religion whatsoever….perhaps he esteemed being a philosopher much more than being a Christian. "3 What Vasari should have said is that, like the priest and philosopher Marsilio Ficino and many others, Leonardo preferred the biblical Christ's esoteric philosophy to Church dogma about the historical Christ. In 1944 Ananda Coomaraswamy noted that "there is every reason to believe that Leonardo, like so many other Renaissance scholars, was versed in the Neo-Platonic esoteric tradition, and that he may have been an initiate, familiar with the “mysteries” of the crafts. "4 So, even if Church followers did not understand how Leonardo's universalist philosophy fit Christian tradition, great artists would have. Vasari himself probably knew more than he let on. For instance, when Raphael painted The School of Athens, he depicted Leonardo as Plato, the pagan philosopher who had heavily influenced Christianity. Given that Leonardo's picture of Christ is unlikely to be an imaginative depiction of the historical Christ, let's look at other possibilities. Leonardo da Vinci, Christ as Salvator Mundi (c.1499) Oil on panel. Private Collection, USA. 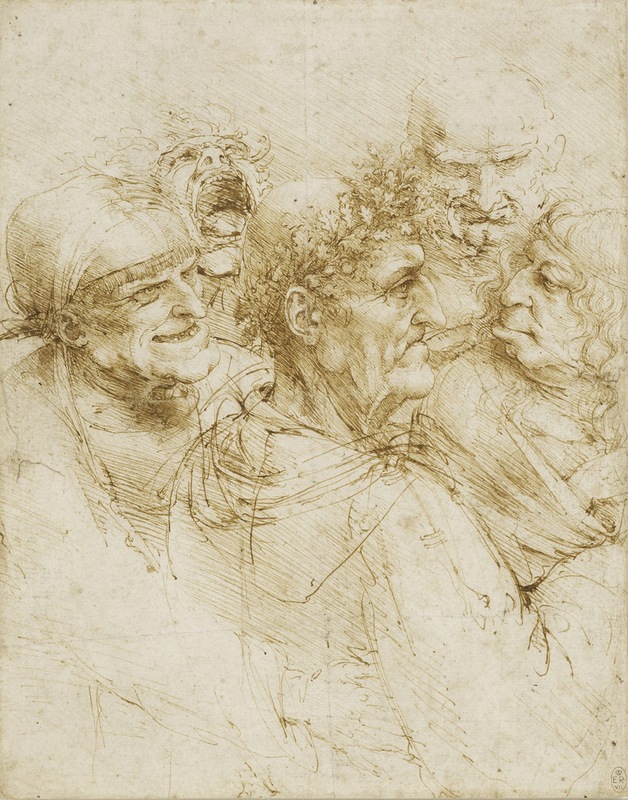 Consider Leonardo's drawing of Five Grotesque Heads. One expert believes that the central figure is an imaginative self-portrait of Leonardo as an older man who, like a patient Christ, is being tormented by the four humors, the powers then believed to govern the body.5 That is precisely how the Inner Tradition works: Christ's life as the archetypal model for our own. 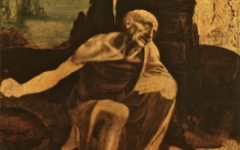 If Leonardo did not represent himself as Christ in this drawing, he certainly suggested that he suffered like him. Leonardo, Five Grotesque Heads (c.1493) Pen on paper. Collection of H.M. Queen Elizabeth II. The Mona Lisa, painted several years after the Christ, is another telling comparison. Unlikely to have been a portrait of anyone other than Leonardo [see entry], the Mona Lisa and Christ share the same perfect roundness to their heads. Yet the very straight hair above ends in spirals and curls below, an unusual combination of hair types. The latter, though, were symbolic forms of great significance to Leonardo used for both hair and water. Each, too, has a middle parting with bags under their sleepy eyes. The lady famously has no eyebrows; if Christ has any, they are difficult to see. With their faces lit identically, all their features from their eyes down are in the same proportions, their noses similar. Lisa's mouth and chin are more delicate but the prochilon, that fleshy protuberance of the upper lip, is uneven in both of them (bottom). Their bodices (top) - if I can call Christ's feminine robe that - are alike as well: thin vertical pleats of delicate fabric hemmed horizontally with a strip of embroidery in a knotted design of the same color. 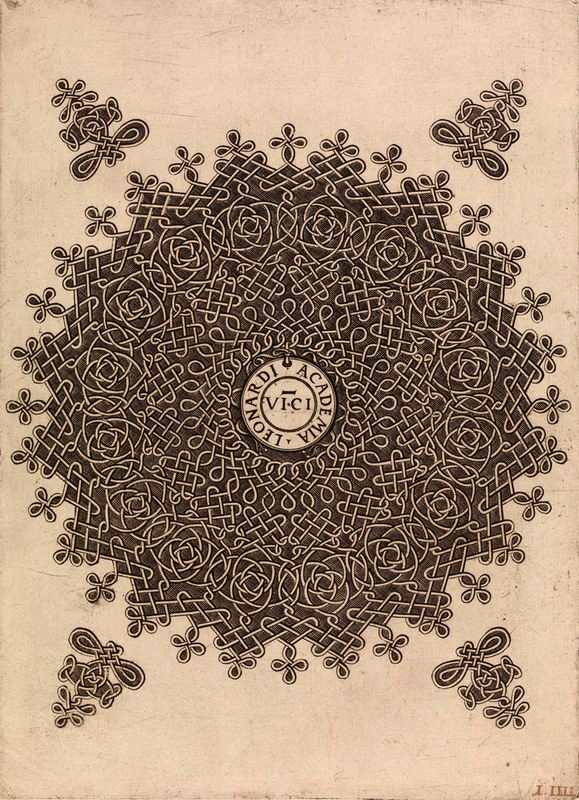 After Leonardo da Vinci, Knot Pattern (c.1495) Engraving. British Museum, London. 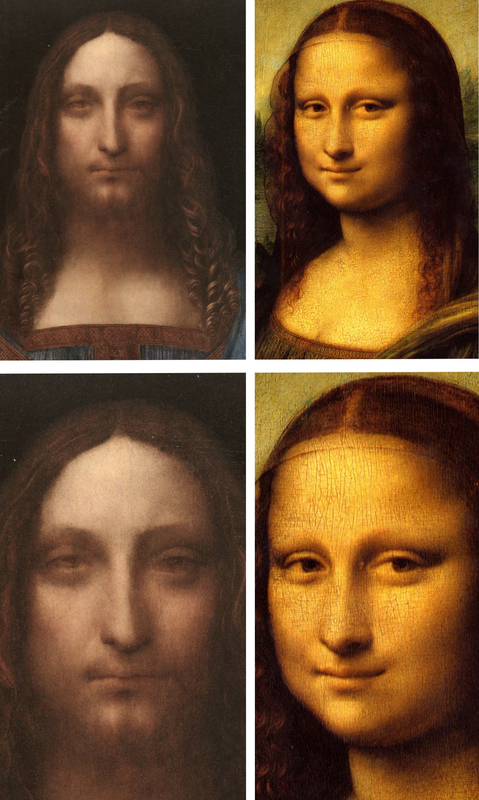 If we now compare Christ's face to Leonardo's (top), the evidence is quite compelling. His well-known "self-portrait", with its known but disputed links to the Mona Lisa, is also similar in proportion and features to the newly-resurrected Christ. Again, they have bags under their tired eyes and their mouths sport that uneven prochilon on the upper lip, the lower lip more fulsome than the upper. 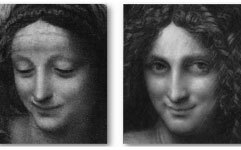 Significantly, the contour of the prochilon only matches if Christ's mouth is inverted as in a mirror (bottom), like Leonardo's writing. 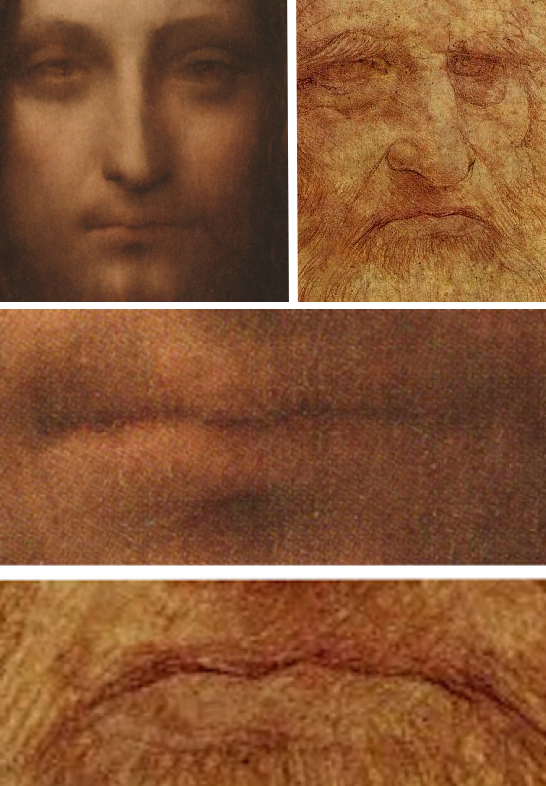 Bottom: Detail of Leonardo's lips, inverted. And that is what the painting represents: a mirror. Christ's hand raised in blessing is a reflection of Leonardo's own hand touching and painting the panel.9 The "mirror", however, does not reflect Leonardo's external image but his inner being. Christ is the mirror of his mind's essence or soul, an anthropomorphic projection of what makes us truly human and connects us to everything. 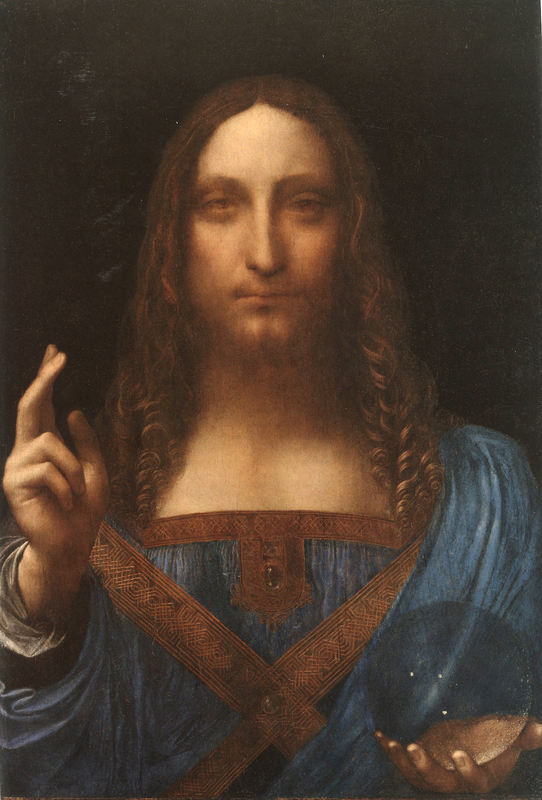 Christ's other hand holds a crystal orb which suggests not only power and cosmic unity but also his palette, his interest in light and lenses, and the purity of his inner eye which was portrayed in the Renaissance as globular. Thus his hand and eye, like craft and vision, combine. As always, there is far more to explain than I either have space for or currently understand but at least Leonardo's panel can no longer be seen as a portrait of the historical Christ. Would Leonardo have painted anything so boring? Its secrets contain more mystery than that, more meaning, and more wisdom too. Lastly, if this explanation seems unusual or abnormal, keep in mind Dürer's Self-Portrait as Christ (1500). 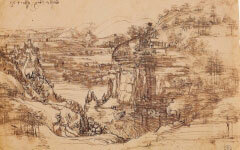 He painted it the other side of Europe within a year of Leonardo's. As did Mantegna (c.1500) and Perugino around the same time, both in Italy. The widespread misconception that Leonardo's portraits are depictions of real people can only be grasped as a misconception when one recognizes that even his depictions of biblical figures are not what they seem. 1. "Lost Leonardo Da Vinci painting to go on show", BBC News, 12th July 2011. Retrieved from http://www.bbc.co.uk/news/entertainment-arts-14104031. Accessed Feb. 23rd 2014. 2. The Virgin of the Rocks has been accused of blasphemy too. Lynn Picknett, Mary Magdalene: Christianity's Hidden Goddess (London: Robinson) 2003, pp. 20, 25-29. 4. Coomaraswamy, "The Iconography of Dürer’s Knots and Leonardo’s Concatenation", The Art Quarterly VII, Spring 1944, pp. 109-28. 5. Gloria Vallese, "Leonardo's Malincholia", Achademia Leonardi Vinci 5, 1992, p. 44. Many scholars also believe that Leonardo's Self-Portrait is his idea of what he would look like when older. 8. It is also believed that a link exists between Leonardo's knotty designs and the labyrinths on the floors of many Italian cathedrals. The knots also bring to mind weaving, a theme used by Dante as a metaphor for poetry. Leonardo would have known that. The association of weaving with literary creation was also common in antiquity. For labyrinths, see Note 4 above. For weaving, Pamela Royston Macfie, “Ovid, Arachne, and the Poetics of Paradise” in The Poetry of Allusion: Virgil and Ovid in Dante’s Commedia, ed. R. Jacoff and J.T.Schnapp (Stanford University Press) 1991, pp.158-72. 9. Christ's hand blessing reflects Leonardo's own brush-hand because the act of painting was, from the very earliest times and up into the Renaissance, a sacred act. Most medieval artists were monks or worked in monasteries. They prayed before painting to calm their mind because, in creating a masterpiece, it was God who worked through them. They themselves were only a conduit as Picasso and secular artists continued to assert in the twentieth century. Original Publication Date on EPPH: 22 Feb 2014. © Simon Abrahams. Articles on this site are the copyright of Simon Abrahams. To use copyrighted material in print or other media for purposes beyond 'fair use', you must obtain permission from the copyright owner. Websites may link to this page without permission (please do) but may not reproduce the material on their own site without crediting Simon Abrahams and EPPH.